Mega Sale! Save 24% on the May Arts SM-32 String Burlap Ribbon, 400 yd, Antique Gold by May Arts at Designers Artists. MPN: SM-32. Hurry! Limited time offer. Offer valid only while supplies last. May Arts ribbon is known for its fashionable designs and superior quality. This thin Antique Gold burlap string is a May Arts ribbon favorite! May Arts ribbon is known for its fashionable designs and superior quality. 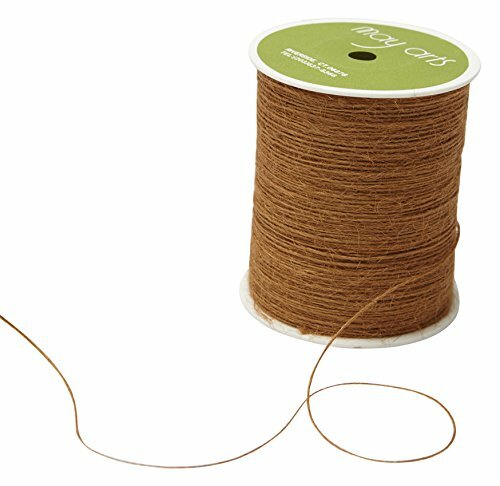 This thin Antique Gold burlap string is a May Arts ribbon favorite! although it's a thin twine, it has a variety of uses thanks to its durability. The fibers that run along the edge of the string give it a unique look like any other burlap twine available. Burlap twine can fit every craft theme from elegant to romantic. Mixed with laces it can Evoke vintage romance, or with a woven ribbon can look quite rustic. Gold is a great neutral instead of brown or black. Gold ribbon is a great choice for the holidays or fall time. Whatever the use, May Arts' ribbons are the perfect finishing touch for all of your beautiful creations.